Jacket: Jcrew (similar here). Shirt: Equipment. Skirt: Blaque Label (similar here). Purse: Coach ‘Willis’. Shoes: Zara (old). Belt: Jcrew (old). Lips: NARS ‘Schiap’. Nails: London ‘Teddy Girl’. Sunglasses: Karen Walker. Pin: Vintage Chanel. Jewels: David Yurman, Jcrew, Pomellato, Michael Kors Watch, JewelMint. chanel on military jacket? Love it! I love the JCrew chain bracelet!! Amazing combinantion! only you can wear camouflaje – ballet skirt and be perfect!! Gorgeous! I love the nail polish color! Chanel and milatary – great, unexpected pairing! I love your style, always amazing! Great jacket! Love your pics, do you use a professional photographer on all of your pics? the camo with the chanel is divine. you look so great! i just love all your accessories!! Such a chic combination of patterns and items! YOU ARE AMAZING PERSON ! I LOVE TO VISIT YOUR BLOG ! Love your pink lipstick with the camo! Love this! You make camo look so chic! I am obsessed with that jacket! so beautiful! Love the jacket with the Chanel pin! And as always gorgeous look! Saw the preview on Instagram yesterday and was excited to see the whole outfit!! Looks great! what a FABULOUS combo!!! one of my faves to date! No one is cooler than you. Love your pose in the last photo! Love the bag! And the pin! I just love the military jacket with this feminine skirt, such a fun mix. You look amazing! I love how you styled this look! So chic. the brooch is perfect for the jacket. oh i dooo love your skirt! Just posted about camo yesterday & Love the way you put this together! You look so cool here! Love this edgier look today. I love how you made the cameo look less intimidating and even very girly looking! Great look! I was already in love when I saw this on twitter! Love the contrast of the camo jacket w/ the prim skirt which, by the way, is such an awesome shape! Love the jacket and accessories! I L O V E YOUR JACKET !!! G R E A T!!! gorgeous as always blair! love the pin! Chic military style – Chanel meets a military inspired jacket. LOVE IT. I'm totally in love with this camo jacket and the way you styled it! That skirt looks sooo perfect with those shoes!! I love it! amazing look. i specially love your jacket and your shoes. Visit my blog and participate in my giveaway!!! Thanks a lot!! nice day!! you made this military jacket absolutely chic!!!!! love it!!! Stunning outfit, I love your jacket! Love this look, I wan that Chanel pin so bad every time you wear it. Hope you have a lovely weekend. I don't think anything will ever convince me to wear camo, but you look cute. Stunning outfit. Love the Chanel pin. Qué look tan bonito! Me encanta la falda. Love me some cameo, that coach bag is great. I love mixing the jacket with the flowy skirt. You have great taste. Never would of thought of camo! Great outfit! loooove love love love love love LOVE. You make camo look so chic! Wow! Would the camp look this chic without that HUGE Chanel pin? I don't know…but I love this look! that outfit is so perfect!! Love, love, love this look! You truly are a style icon. military chic – i love it! OK you make 'men in uniform' look BLAH now…love this. Fabulous look, honestly one of my favorites, nobody executes juxtaposition like you do!! black and brown, and camp and pearls… Perfection!! How I wish those shoes were still available! Great look! Especially those shoes and the skirt! xoxo J.
i love the chanel pin! Everything about this look is SICK!!! Fantastic as always. I love how you added the Chanel pin to the army jacket! Love the military jacket! You still make it look so chic. Great look! I love this tipe of bags!!! I waver on whether I can make camo 'girly' enough like my usual style – but you pull it off perfectly! Props for pulling off camo with a feminine look! Military style is very fashionable now! Totally HOT! You look stunning in camouflage! best military outfit ever ! It's amazing how you've made that camo jacket so glam! I like the idea of injecting some Chanel couture in the army, their uniforms could use it. The way you paired the belt with the jacket to cinch in your waist really makes it more feminine. Your purse is just perfect to pull together the belt. i adore this outfit! you look amazing. I'm loving the fashionable military uniform today. It goes perfect with the Coach Willis bag. You always look fabulous! In love with your skirt and shoes. Lovely outfit! Crazy about the skirt! I love it! This is such an amazing look. Love the Chanel brooch on the camouflage jacket. 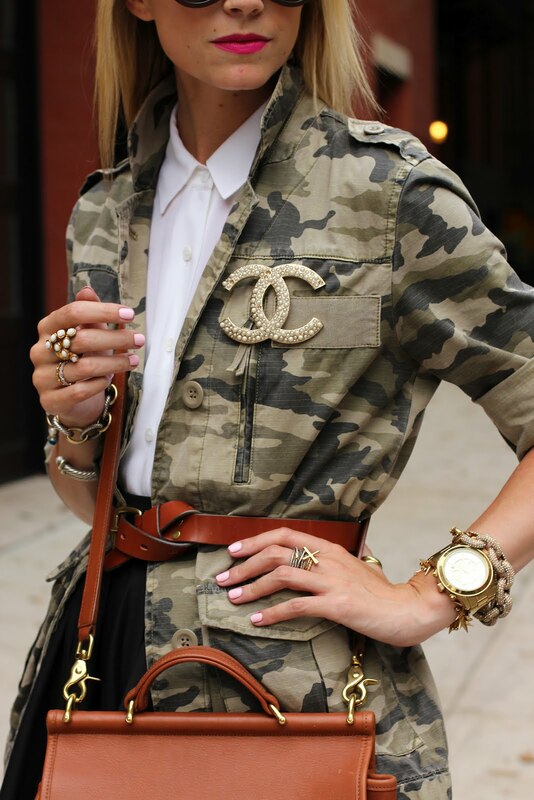 Love the Camo with the Chanel brooch! You mix pieces so well! One of your best outfits ever! Love camo! Such a beautiful look and combination! great, as per usual ! i like the soft manicure against the bold outfit! Amazing outfit!Love the silhoutte, the camo pattern & the brown leather accesories…well, I love everything! Love the way you accessorised the military jacket with the Chanel brooch – gorgeous! This look is very beautiful, I love it. I love your blog. I follow now. LOVE your outfit! Especially the Chanel pin and jacket! Love the. Belt that you paire. It. With!!! Only you could pull off something that daring! heyy military prints are back! And they look good with that tulle skirt. I love reading your blog, but everytime I want to catch up on older posts that i'd missed, it comes up a new pop up window. By the end of the last caught up outfit (sometimes 2 months back), I have a zillion pop ups open. Can you change the format so your readers can look at your blog with ease? The camo print is so unexpected but works so well styled with your other feminine pieces and that lip color. Stunning, as always! I love how you've styled that camo jacket, so sassy! You are probably the only person I've seen who can pull off camo that well! I love how you incorporate that brooch into your outfits. Classy! not sure about the proportions here (or in your other most recent short-puffy-skirt-with-form-fitting-top-ensembles). You look amazing! Camouflage is so awesome. I need some. Love the military jacket accesorized this way. you look fabulous. Really nice outfit! I like how the masculine print is made feminine! Great jacket!. Love this look!!!. This look is made of fab! I love it! i really love it. great combination, wanna have the look ! London teddy girl for nails is the best of the best! Amazing look!! Perfect mix of girly and tough! You made this so chic! chanel pin could use a renovaton,few stones are missing ,looks chip. I just scored this Chanel pin on Ebay in tortoise- I wouldn't really have considered it if I hadn't seen your blog and cool ways to wear it! So thanks! Love the camo style! What would be even more amazing would be to match the camo jacket with a camo iphone 4 case with the same matching camo design style. You looks Gorgeous in camo shirt. It's nice when you can adore fashion just as a pure creations, covered with prints, chains….